The enemy prototyping continues! This week a lot has happened. First, we change our mind about the bird mechanic I mentioned previously, with different eggs causing different mishaps if you let them hatch. We agreed it got a little bit too crazy and reminded everyone a bit too much of the Mimic battle you just completed, so instead we’ve been playing around with each egg hatching a swarm of smaller birds to harass the player! In this first version (above) we used the bat swarm as placeholder graphics for the swarm to test it out. At this point it was also possible to end a swarm by hitting it, however, since you can’t remove bat swarms by hitting them, and this mechanic will work and look in a similar way, we decided that you won’t be able to in the final version. Next up, there are more portraits (but we’re slowly reaching the end!! Just a few more)… This one’s the Lady Mayor, either the actual Mayor or the wife of the Mayor (not decided yet) of the Desert Town. The second portrait this week belongs to one of the older NPCs of this area – in terms of when Fred made the sprite, anyway! I wanted to make this portrait a while ago, but there was a lot of other characters made that somehow leap ahead in the to-do list. Now, however, it’s finally time for mr sunscreen (he applies sunscreen in his animation) to get his portrait! Alright, now it’s time to start working on another interior!! 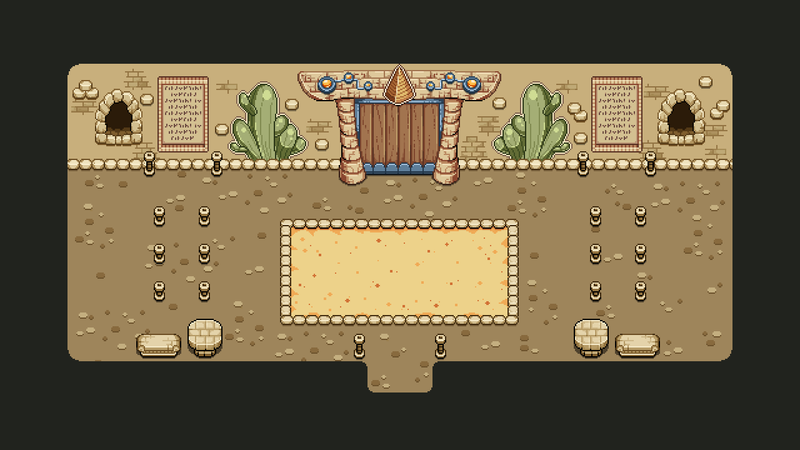 This here is the “legendary” desert ruin, where you’ll face a new boss/mini-boss kind of deal and continue the main story! In this first part I’m focusing on getting the basics done – this involves some color tweaking of the graphics I made before, plus some new stuff. The video got quite long so I’ve decided to split this in several parts – I think there will be three in total! …and here we have the second part of those desert ruins! This time we focus on adding wall decorations mainly – there’s a bunch of them needed, from the door, to the script tablets where you can read some juicy(?) backstory, to the decorative cacti! Posted by Secrets of Grindea at 2018/07/02. Tags: animation, Enemies, environment, gif, Portraits.